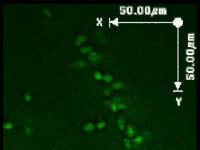 Demonstration of Cx45 knockout mouse embryos (E9.5) with LacZ expression driven by the Cx45 promoter in place of endogenous Cx45 expression. A) Wild-type B-E) Heterozygous Cx45 knockout, F) Homozygous Cx45 knockout. Views of the dissected Heart tube from Cx45 knockout mouse embryos (E9.5) with LacZ expression driven by the Cx45 promoter in place of endogenous Cx45 expression. 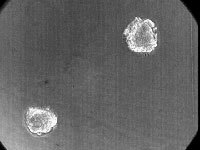 Cell migration in cultured embryo sections demonstrating primordial germ cell migration in mouse embryos (embryonic day 9.5). 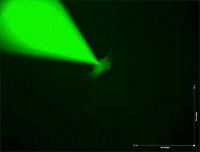 Primordial germ cells appear fluorescent because they contain the transgene Oct4-EGFP. MRI of Fetal Mouse Heart. Ultrasound of Fetal Mouse Heart. 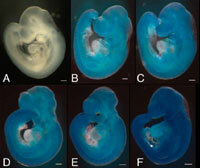 EFIC Reconstruction of E16.5 Mouse Embryo. 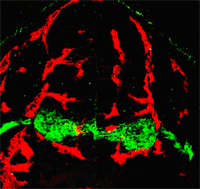 Nerves (green) associate with arteries (red) in the embryonic limb skin. 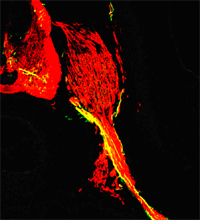 Motoneurons and their progenitors (green) are surrounded by blood vessels (red) in the embryonic spinal cord. 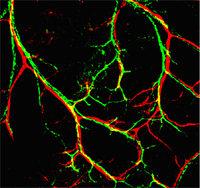 Transplanted murine motoneuron progenitors (green) differentiate motoneurons that project axons (labeled by anti-Tuj1 antibody, red) from the ventral root of the chick spinal cord.